It could be uneven tension across the head or it could also be a bad insert. Timekeep69 wrote: It could be uneven tension across the head or it could also be a bad insert. Either uneven tension, but usually that shows, with the wrinkles. hm, thats weird. never heard of that. I would take the head off of the drum and tighten the nuts and bolts, maybe? Gretsch Catalina Maple-------> 22" x 18" bass, 10" x 8" and 12" x 9" toms, 14" x 14" floor tom, 16" x 16" floor tom, 6" x 14" snare. 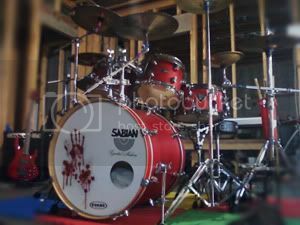 Zildjian A Customs-------> 20" ride, 16" crash, 18" fast crash, 14" hi-hats.